Bettas' famous long fins are vulnerable to damage. Under ideal conditions, a betta can regrow damaged fins without much in the way of special care. However, in adverse situations, stress or poor water quality can encourage complications like infection. If you plan on keeping bettas, you need to learn to recognize the signs that a particular case of fin damage requires intervention. Bettas can injure their fins any number of ways. Transporting them to new aquariums can cause injuries; other fish may nip at bettas' fins, causing damage; poor water conditions, like cold or unclean water, can encourage aggressive cases of fin rot, whereby bettas' fins disintegrate. You need to figure out the underlying cause of fin damage to encourage recovery. 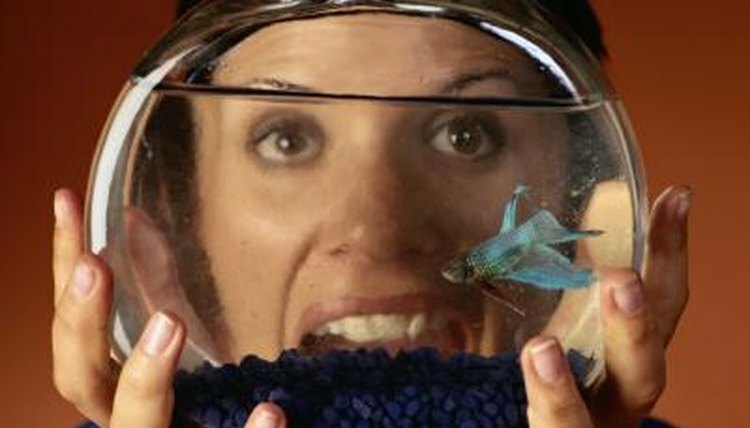 While a betta under ideal conditions can regrow fins without complication, many bettas do not live in ideal conditions. Bettas live longer, healthier lives in real aquariums, as opposed to bowls. Mostly, the combination of heated and filtered water helps bettas thrive. Bettas come from the tropics and therefore need water whose temperature is between 74 and 79 degrees Fahrenheit. Clean water improves their health substantially -- but most betta bowls cannot accommodate a filter, so water changes are your duty. Unfiltered cool water promotes fin rot in injured fins. The serious infection can destroy fins and kill fish. If you do not see signs of fin rot, you can leave a betta with a torn fin to heal on his own. If your betta lives in heated filtered water, the fish will likely heal quickly. Some sources indicate that feeding foods with B vitamins like Daphnia may improve fin regeneration. However, fin damage that has a fuzzy or slimy-looking coating, or a ragged margin rather than a clean split, is indicative of fin rot and need to treat it. If you see any signs of fin rot, you need to intervene immediately. Salt treatments can work, but they generally work less consistently than topical medication from the pet shop. However, you can use salt treatment alongside topical medication. To treat with salt, dissolve 1 teaspoon of aquarium salt per gallon of water. With aquarium medication, always remove chemical media like active carbon inserts and follow the manufacturer's instructions to the letter.